Just a note to say thank you for providing a fantastic buffet for our wedding reception. Myself, husband and all our guests were very impressed and thought the food was delicious and fantastically presented. We will definitely be recommending Food Love Catering to all our family and friends for their catering needs. Thank you for what really was a perfect night. I’ve had only the best compliments towards your food and it really did make the party (and indeed every lunch after for the next week). Thank you for a wonderful evening on Saturday. We couldn’t have had better at a 5* Michelin Restuarant (not that we have ever been to one). Looking forward to another amazing experience in the not too distant future. Thank you all so much for a simply perfect night – we all so enjoyed it ! The food was, as always, tremendous & the whole evening was a rollicking success – thanks to you! 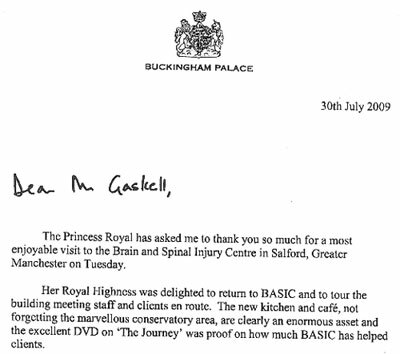 The Princess Royal has asked me to thank you so much for a most enjoyable visit to the Brain and Spinal Injury Centre in Salford, Greater Manchester on Tuesday. Her Royal Highness was delighted to return to BASIC and to tour the building meeting staff and clients en route. The new kitchen and cafe, not forgetting the marvellous conservatory area, are clearly an enormous asset and the excellent DVD on “The Journey” was proof on how much BASIC has helped clients. I have been asked to send congratulations to everyone involved in the latest improvements and to send you every possible good wish for the future. Last but not least, The Princess has asked me to thank you for the delicious buffet lunch. On behalf of the Inner Wheel Club of Astley, I am writing to thank you so much for giving us such a superb dinner on Thursday. We all agreed it was our finest Christmas Dinner ever! Please will you pass on our thanks to Jacob for looking after us so well. With our best wishes for Christmas and good health and success for the New Year. Thank you so much for all of the thought and hard work that went into making our wedding day so enjoyable. There were so many comments about the food and beautiful presentation. The idea of waiting on guests with trays of ‘miniature meals’ worked really well. The steak &onion ciabattas with chunky chips was a winner and the individual ‘miniature desserts’ went down really well. The afternoon 3 course dinner was also beautiful. Sorry for taking so long to write, but we have only just got back from our honeymoon! We wanted to say a big, big thank you for the wonderful spread you did for us for Jayne’s special birthday, it was a delight to see and very different, all the food was really tasty. The Ham Hock terrine went well and the ice mountain with crayfish was a real talking point. I could not fault anything, the strawberries in liquer with honeycomb were great, I had too many really. Also the cakes, I had the Christmas Cola cake and the chocolate amaretto torte. You were very professional in your dress and attitude and we hope you do very well with your venture. Jayne was so happy with it and some of her friends said it was the best buffet they had been to, which I whole heartedly agree with. Thank you for helping the night go well. When I needed to find a good catering company to provide the food for the opening of the new BASIC charity kitchen by Princess Anne, I couldn’t think of anyone better than you. You certainly had your work cut out with having to do a separate buffet at the same time for The Princess Royal and her bodyguards. You were also delayed when you arrived by the security searches of your van and equipment that had to be carried out with royalty being in attendance. Despite all this, the food was superb and served on time! Thank you very much for helping to elevate the occasion. I attach a copy of the letter I received from Buckingham Palace where the ‘delicious buffet’ you provided for Princess is mentioned, which I thought you would be pleased to see. I write to thank you for wonderful evening. It rounded off my birthday and made it an evening to remember. The food was excellent and of the highest quality which we all enjoyed and we all felt that we were treated as royalty with the excellent service we received. Again many thanks, it will be an occasion we will never forget. Just a few lines to say many thanks for the delicious food for our Theatre Dinner on 19th July. Everyone commented on the amount and quality of the food both verbally and in writing and the whole evening was a huge success. Can I also thank you for being so quiet, which was an amazing feat in itself when you consider all the equipment which had to be washed, dried and packed away. Quite a few people took your details so I hope this creates revenue for you. Joyce Smith, Phoenix Theatre Company. To Keith and Sarah and all the staff at Food Love with sincere thanks and appreciation for the beautiful buffet which was prepared and presented with loving care and was absolutely delicious it made Emma’s farewell celebration perfect. Simply a touch of the gastronomic class!